Wall Street criticized a $2.3 billion cost increase at the Plant Vogtle nuclear expansion project in Georgia, largely because Southern Co. could not give assurances that it wouldn’t happen again. Southern announced Wednesday that its Georgia Power Co. would absorb a $1.1 billion increase for its share of the project. The amount included $700 million in capital costs and a $400 million contingency, which the utility may seek to recoup from customers later. Moody’s Investors Service downgraded the credit ratings of Georgia Power, noting that the rising costs came just eight months after state utility regulators signed off on a new cost and schedule for Vogtle. 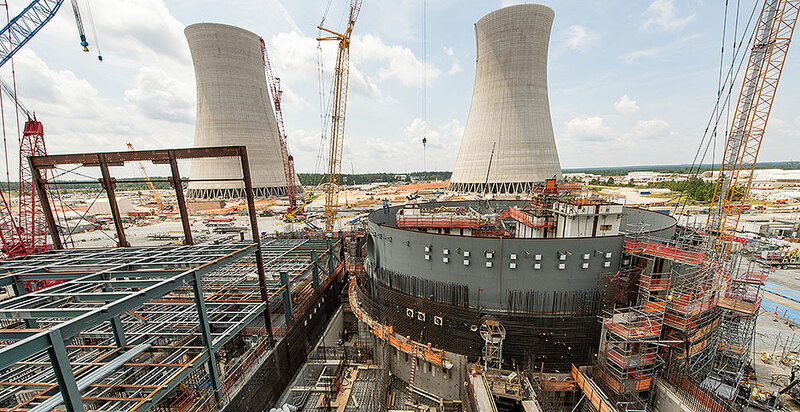 The rising price tag is “demonstrating the ongoing challenges and execution risk with the continued construction of the Vogtle project,” said Jeff Cassella, a senior credit officer with Moody’s. The issue is broader than the newly revealed costs, the rating agency and analysts argue. It’s that Southern CEO Tom Fanning reiterated Wednesday that getting Vogtle’s reactors on the grid by November 2021 and 2022 hinges upon hiring more craft workers and significantly ramping up the amount of work done each day. Southern Nuclear and Georgia Power took over for Westinghouse Electric Co. LLC last year when the contractor went bankrupt. Productivity improved, and the utility maintains it will be able to meet the November 2021 and 2022 deadlines for the reactors to start producing electricity. The Georgia Public Service Commission signed off on those dates as well as some financial penalties if Georgia Power doesn’t meet them. Fanning said it was too soon after that agreement for Georgia Power to return with another cost increase. Regulators agreed. “I think they understood they didn’t need to come back to the commission looking for another boost,” PSC Chairman Lauren “Bubba” McDonald said in an interview with E&E News. McDonald also took a swipe at the ratings agencies. “When something like this occurs, and those so-called ‘experts’ in New York, not calling any particular one, somewhat blackmail the commission because they say, ‘If we don’t get those earnings, we’re going to be downgrading the company,'” he said. Georgia Power spokesman Jacob Hawkins said the utility remains focused on operating its business effectively and efficiently. This includes maintaining strong credit ratings and “making financially sound decisions for our customers, employees and shareholders,” he said. The new figures stem from Southern’s nuclear unit and Bechtel Corp. expanding their scope of work, including project management and oversight, to ensure they can finish the reactors on time. The new costs did not come up during a recent routine review of Vogtle’s cost and schedule, which included hearings in May and June. This is because Southern Nuclear and Georgia Power had not found them at that point, Hawkins said. Georgia Power will include details in an upcoming report that will be filed Aug. 31. Vogtle was years behind schedule and billions of dollars above its original forecasted budget when Southern Nuclear and Georgia Power took over last year. The project went through at least three significant contractor changes with the promise each time that work would be done right and on time. Doing so would help keep costs under control. Those promises were broken every time. Southern Nuclear and Georgia Power brought in a newfound confidence that they would maintain the new cost and schedule. That and the noticeable productivity increase was something that the utility and the PSC staff has pointed out. But the costs went up anyway, and this is with work currently tracking ahead of schedule, according to the companies. Fanning told analysts that they must ramp up work to peak a productivity rate and stay at that level for the next 18 months. Just a two-month delay would push the reactors back into a scenario that the PSC staff deems “uneconomic” for customers, however. “[Wednesday’s] announcement confirms that the Vogtle expansion project is riskier than ever,” said Jill Kysor, an attorney with the Southern Environmental Law Center. Georgia Power is building Vogtle with a group of public power companies. All of the utilities updated their partnership agreement last year, requiring at least 90 percent of the owners to vote on whether to continue construction under certain conditions. That Vogtle’s cost increase is more than $1 billion and Georgia Power has chosen not to recoup its share are two of those conditions. Southern’s board has again greenlighted the project, but at least two of the public power companies — Oglethorpe Power Corp. and Municipal Electric Authority of Georgia — must vote to do the same by the end of the third quarter. “The other owners cannot absorb the higher costs with shareholders; those costs are going to be passed on to their customers,” said Liz Coyle, executive director for Georgia Watch.